Flow cytometric analysis of NCI-H1650 cells (blue) and NCI-H3255 cells (green) using EGF Receptor (L858R Mutant Specific) (43B2) Rabbit mAb (PE Conjugate) (solid lines) or a concentration-matched Rabbit (DA1E) mAb IgG XP® Isotype Control (PE Conjugate) #5742 (dashed lines). 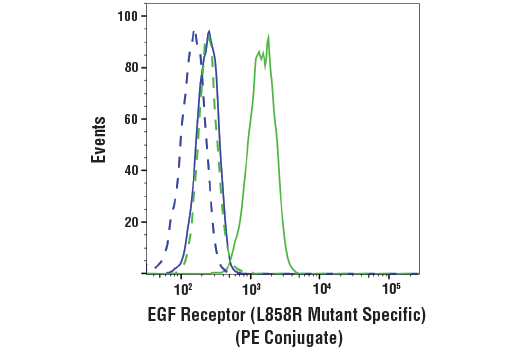 EGFR (L858R Mutant Specific) (43B2) Rabbit mAb (PE Conjugate) detects endogenous levels of EGFR mutant L858R protein. The antibody may cross-react with wildtype EGFR and other HER family members when highly over-expressed. Careful titration of this antibody may be required to obtain optimal specificity. Monoclonal antibody is produced by immunizing animals with a synthetic peptide corresponding to L858R mutant sequence of human EGF receptor. This Cell Signaling Technology antibody is conjugated to phycoerythrin (PE) and tested in-house for direct flow cytometry analysis in human cells. This antibody is expected to exhibit the same species cross-reactivity as the unconjugated EGFR (L858R Mutant Specific) (43B2) Rabbit mAb #3197. The epidermal growth factor (EGF) receptor is a 170 kDa transmembrane tyrosine kinase that belongs to the HER/ErbB protein family. Research studies have shown that somatic mutations in the tyrosine kinase domain of EGF receptor (EGFR) are present in a subset of lung adenocarinomas that respond to EGFR inhibitors, such as gefinitib and erlotinib (1-3). Two types of mutations account for approximately 90% of mutated cases: a specific point mutation, L858R, that occurs in exon 21 and short in-frame deletions in exon 19 (4,5). The most frequent exon 19 deletion is E746-A750, accounting for 90% of lesions at this site, although some rare variants occur. Lynch, T.J. et al. (2004) N Engl J Med 350, 2129-39. Haber, D.A. et al. (2005) Cold Spring Harb Symp Quant Biol 70, 419-26. Kosaka, T. et al. (2004) Cancer Res 64, 8919-23. Riely, G.J. et al. (2006) Clin Cancer Res 12, 7232-41.